The next generation of Oculus Rift is here, and the improvements make an impressive device even more impressive. Oculus Rift inventor and Oculus VR CEO Palmer Luckey has been coming to CES for years now, but this year is different. Very, very different. Rather than fighting to get the attention of manufacturers and tech giants, they are now coming to him, and several of the vendors at CES are even trying to use the Oculus Rift to enhance their own products. Luckey’s invention, the Oculus Rift, is one of the few products that has earned the title “game changer” and can actually live up to that. The virtual reality headset has people excited, and that excitement has led to well over $100 million in funding. With that money, Oculus has continued to refine the Oculus Rift in preparation for an eventual retail release. The previously released developer’s model that sold for $300 was just a taste of the finished product, and it had several issues – perhaps most notably the motion blur. Turning your head quickly could cause the image to blur and distort, which in turn caused some people to experience motion sickness. It was a problem Oculus was always aware of, and always planned to correct. With the new Crystal Cove version, it isn’t completely gone, but the headset has taken a big step in the right direction. When you watch a movie, you aren’t seeing a single continuous image. Instead, you are seeing multiple frames per second, which your eyes then relay to your brain which processes them as one image. The same is true of video games, which used to boast about offering 60fps, but now are ashamed if they can’t reach that. With Oculus Rift, things are a bit different. Rather than trying to give you more information, the Crystal Cove deliberately gives you less. According to Luckey, the key to putting forward an image that looks consistent is what he calls “Persistence of Vision.” With the Crystal Cove, when you move quickly, the image you see is actually truncated. The frame shows the correct image, but then cuts to black until the next frame shows the next image like a shutter effect. The result is that your brain fills in the gaps for you and produces a smooth and consistent image. You are essentially tricking your brain into seeing a single image. The result is a better experience with less motion blur and crisper visuals. 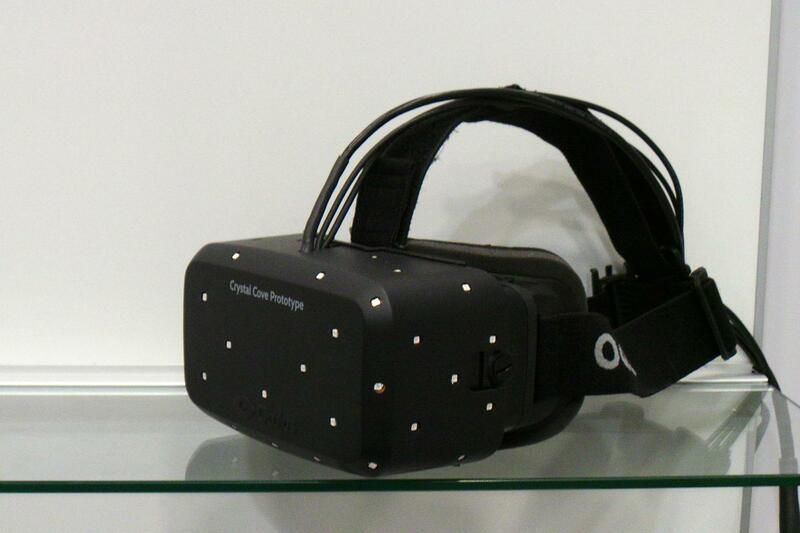 While the developer Oculus Rift was exciting, the Crystal Cove is a big step forward. The second major improvement is the new motion tracking. The headset now has several dots on the front of it, which are tracked by a camera – which was also developed by Oculus – that then tracks the movement of your head to recreate that in the image you are seeing. If you crouch, the image will reflect you crouching. If you lean, it will look like you are leaning. In the previous model of the Oculus Rift, part of the complaints that led to motion sickness were due to the lack movement tracking. Your physical movements weren’t completely recreated in the virtual world, which causes disorientation and inner ear confusion. With the new camera that allows for motion tracking, you can crouch in real life and have that movement recreated. Peak around a corner by leaning out, and you will feel like you are peaking around a corner. It is a big improvement. The displays have also changed from LCDs to OLEDs, which cuts down on latency and offers a crisper image. There is still no word on retail pricing or availability, and the Crystal Cove model isn’t quite where Oculus wants its retail product to be yet. The company is definitely on the right track though. Be excited.